Tamayo-Mas, E, Harrington, J F, Brüning, T, Kolditz, O, Shao, H, Dagher, E E, Lee, J, Kim, K, Rutqvist, J, Lai, S H, Chittenden, N, Wang, Y, Damians, I P, Olivella, S. 2018. 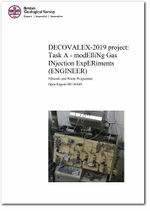 DECOVALEX-2019 project: Task A - modElliNg Gas INjection ExpERiments (ENGINEER). Nottingham, UK, British geological Survey. (OR/18/049). This page was last modified on 11 February 2019, at 10:08.